Kelly’s podcast offers rare and candid access to major art collectors, typically discreet power players who share their collecting experiences and philosophies with the dealer. It is part of a recent podcast boom among commercial galleries—including David Zwirner, Galerie Lelong & Co., and Acquavella Galleries—who consider them an extension of more established forms of the mythmaking they have historically engaged in through monographic publications, catalogues, or press promotion. In the “print is dead” era, podcasts offer a channel to new and younger audiences, while also producing a type of art-historical scholarship better suited to the 21st century. Kelly’s podcast, the first among the recent boom to launch, is distinctive for its collector-centric approach. Guests have included Dutch sisters Monique and Myriam Vanneschi, the American couple Jill and Peter Kraus (who have donated works to the Hammer Museum and MoMA, whose board Jill sits on), and Rodney Miller, who serves on the board of trustees of the Studio Museum in Harlem and collects work by artists of the African diaspora. 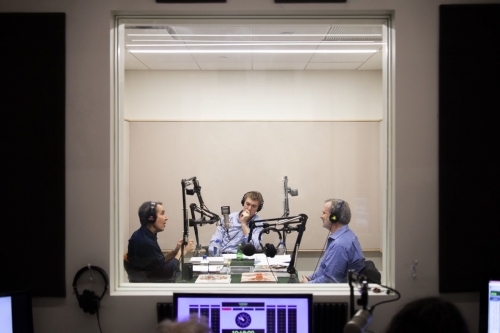 About two months after the launch of the “Collect Wisely” podcast in April, David Zwirner released the first episode of its “Dialogues” podcast. Hosted by the mega-dealer’s son Lucas Zwirner, it features a conversation between artist Jeff Koons and Metropolitan Museum of Art curator Luke Syson. The Zwirner podcast, now in the home stretch of its first eight-episode season, has featured conversations between photographer Stan Douglas and jazz musician Jason Moran, painter Lisa Yuskavage and filmmaker Tamara Jenkins, artist Marcel Dzama and Arcade Fire member Will Butler, and, most recently, writers Peter Schjeldahl and Jarrett Earnest. “A lot of people are making what we now refer to as ‘content,’ and it’s not like you just want to contribute to the content deluge, you want to make something that actually has an audience, that people actually want to listen to,” Lucas Zwirner says. He sees the podcast format as a powerful addition to the gallery’s program, complimenting its exhibitions and its publishing enterprise, and with the distinct potential to reach new, younger audiences around the world. Zwirner says that the podcast’s episodes have been downloaded over 100,000 times since it launched in June, far outpacing the preliminary projections of Slate Studios, which helps produce them. Podcasts’ potential to bring galleries new audiences was also a selling point for Galerie Lelong & Co., which launched its own, entitled “Viewpoints,” last month. Its first episode is a half-hour conversation between gallery vice president and partner Mary Sabbatino and the artist Petah Coyne, whose exhibition with the gallery closed last week. Like Zwirner, Sabbatino considers the podcast a powerful vehicle for developing new audiences, even if there isn’t necessarily a commercial payoff. Lelong’s podcast is produced by Bower Blue, the same content agency specialized in design and visual art that is working on Acquavella Galleries’s new podcast, “The Picture,” which launches this week. Every episode of “The Picture” will open with an introduction from gallery director (and former Met Museum director) Philippe de Montebello. The first episode features Bill Acquavella discussing Lucian Freud with the late artist’s assistant and friend, David Dawson.